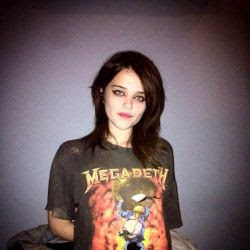 The singer Sky Ferreira presented a new song during a concert at the Observatoire de Santa Ana, California, earlier this week. Entitled "Guardian", the new song will be included on her next album. The singer revealed via Instagram her last two years on the road, where during that time she has come to do the opening show of "Bangerz Tour" by Miley Cyrus. In the social network, Sky also said she will take a month off and, soon after, start the recording of her second studio album. The singer ended the release of the first album of her career, "Night Time, My Time," which yielded the singles "You're Not The One" and "I Blame Myself".